At the Flying Cuttlefish we have covered two big maritime disasters, the Costa Concordia wreck and the recent Viking Sky near-disaster. 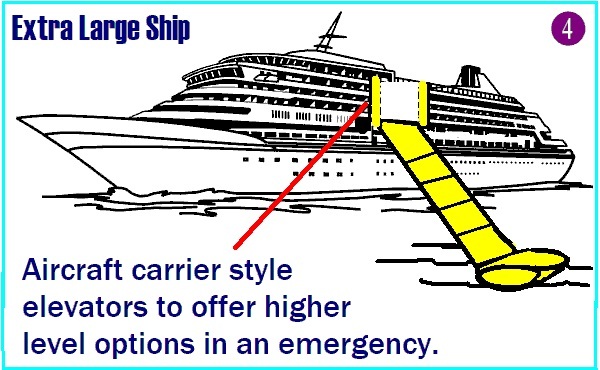 The current large cruise ships are much larger than ships of the past yet they rely on a safety protocol that is a century old. At the Flying Cuttlefish we cannot help but think there needs to be an entire over-haul of this safety system. Today there are much more modern materials to utilize and new computer modeling to test out ideas with little expense. At the turn of the century the safety-net for cruise passengers was the life boat. Over 100 years later this idea may need a new approach. Recent mishaps have shown flaws in the “old” system. 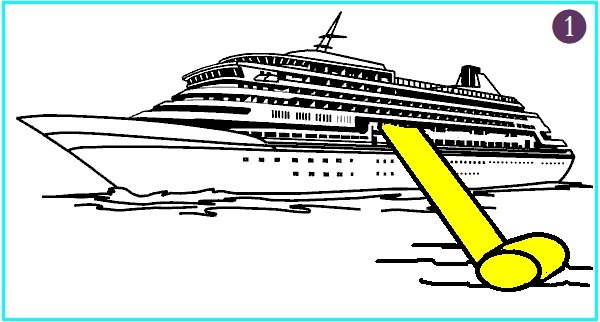 Let’s look at some common denominators in recent cruise ship incidents. The problem with these ship disasters, listed above, seems to be once the ship starts to tilt (list) the life-boat launch plan goes out the window. The most modern, improved life-boat cannot be lowered because the angle of the ship prevents it. The life-boat idea works great in a calm lagoon but fails in real-time situations with a vessel listing as it takes on water for x,y,z reason. It also fails in high seas, as in the nearly disastrous Viking Sky incident. 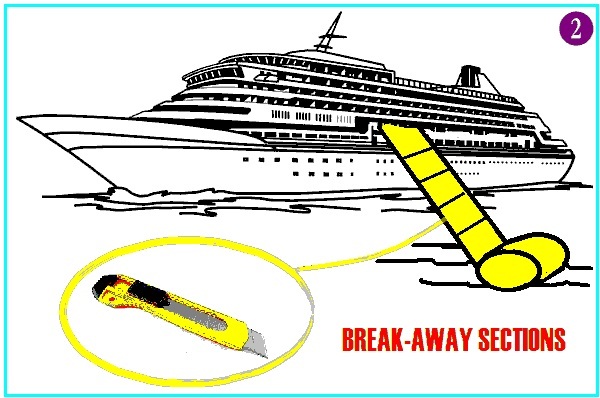 What we are thinking is the whole cruise ship evacuation plan needs to be redone. Forget about the damn life-boats. They are for trawlers. Let’s think about airline escape chutes and box cutters. The science of plastics and rapid-inflation have improved vastly in recent decades. Think about automobile air-bags and the material used to make a Zodiac water craft. And think about the idea of the snap-off box cutter. Think. You put out a small sharp edge and to get another you ‘snap’ it off. It is pre-cut to make the next edge. 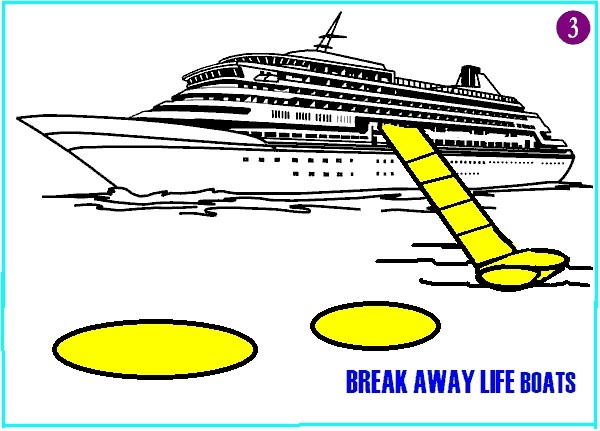 Cannot a rapid-inflate life-raft be made to ‘snap’ off a rapid-inflatable chute in the same manner? Cannot 100 life-rafts be peeled off like toilet paper to create many rescue crafts in a hurry NO MATTER WHAT THE LIST OF THE PARENT VESSEL? Like we keep sayin’ . . . it’s all about the crappy-built spillway put on crappy weathered rock surface. Read the FERC (Federal Energy Regulatory Commission) report – After Action Panel: Assessment of Oroville Spillway Incident Causes and Recommendations to Improve Effectiveness of the FERC Dam Safety Program. 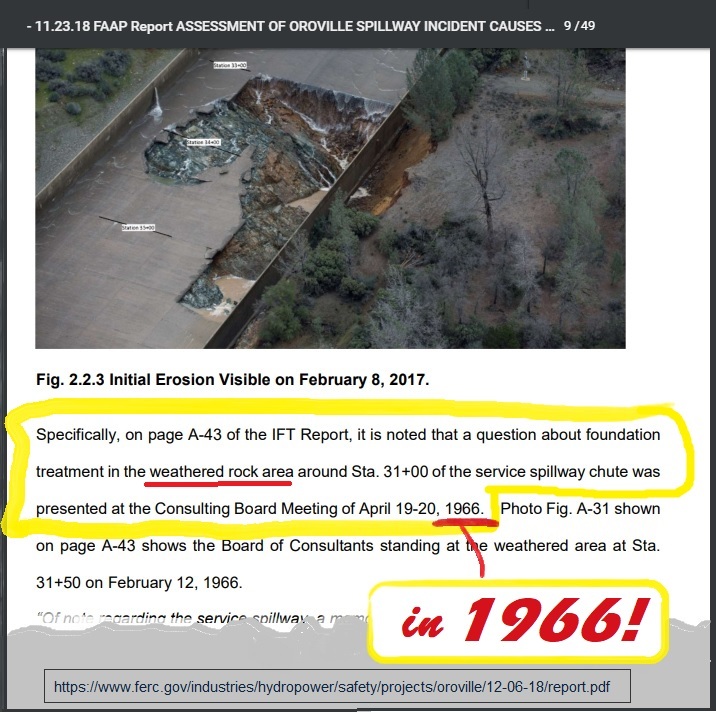 Opinion: for some reason they are rebuilding the spillway on the same crappy weathered rock and will shortly get the same result! People should have gone to JAIL for that! This thing was built sloppily and under-maintained all these years. 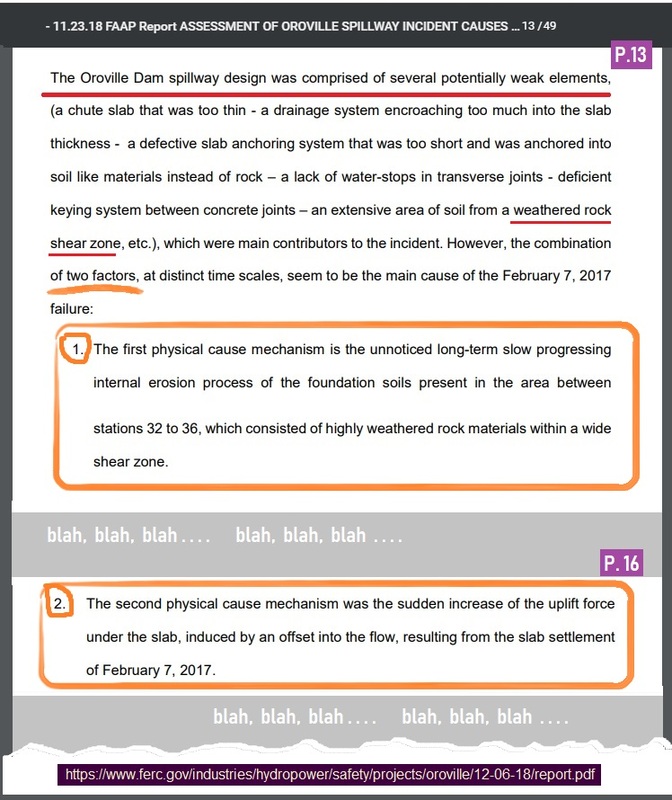 On page 6 they talk about the weathered rock issues and at the end at page 39 they rip into the dam operators (who all seem to still be in charge of the dam). 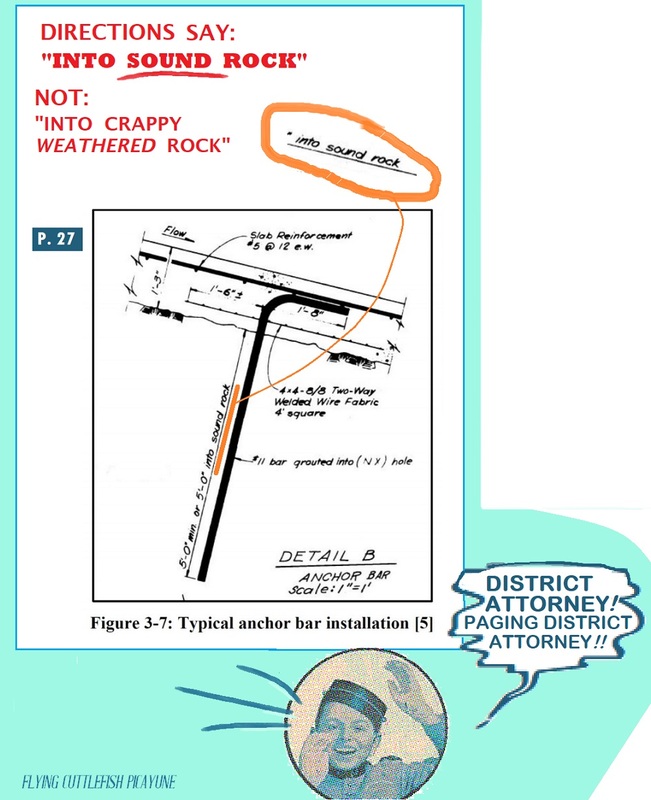 Page 27 details the stability of structure documents that had gone missing from DRW and FERC gave them a free pass when they couldn’t produce them. Page 28 : “Prior to 2003 DWR monitored piezometric levels under the FCO using Carlson type stress meters at various locations along the concrete rock interface. These meters were installed during construction to monitor uplift and to test the effectiveness of the tendons holding the radial gate trunnions.” Then they broke down in 2003 and DRW never replaced them or did any sort of that monitoring again. And nobody went to jail for it! – HUH? So did they do it or not? DWR gets a free pass on that too??? 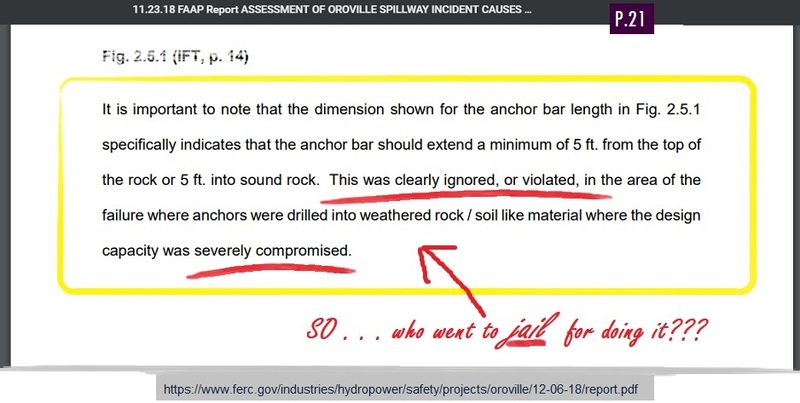 On page 30 it says these inspectors (“consultants”) didn’t bother looking at the spillway geology but relied on DRW’s lies about it. Hidden on page 32 is the whole debacle wouldn’t have happened if they had working piezometric level monitoring. Page 33: “. . . the methods used to detect and evaluate voids beneath the slab were, for the most part, outmoded (i.e. dragging chains along the slab surface and listening to the sound), and more suited for thinner slabs such as road pavements. 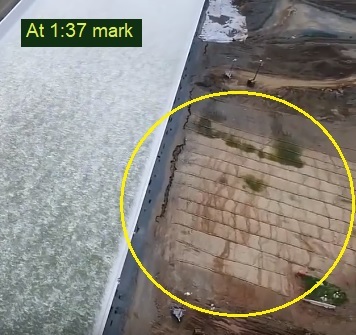 A more appropriate method for this work may have been the use of Ground Penetrating Radar (GPR).” So, will they do GPR or just get out the old chains for the new spillway? OPINION: These criminals broke a ton of laws and their regulators who are supposed to watch over them seem just as bad. 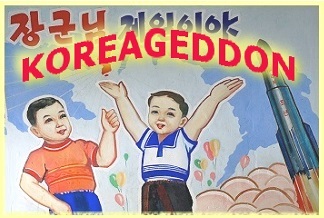 This whole disaster will repeat itself unless new people are put in charge and the good-ol-boys network of “inspection” is busted up. 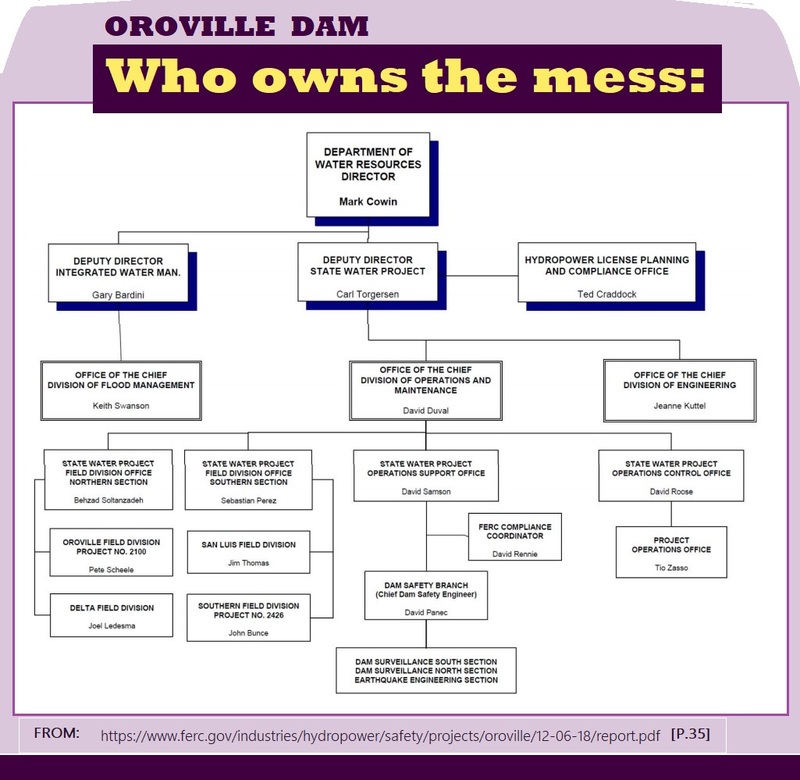 We looked at the Butte County (home of Oroville’s troubled dam) and find their “Interactive” Flood Evacuation Map is just an outline of selected districts with no info at all on where to go. • ZONE 2 thru 11 …. good luck! Mostly you get directed to the best highway any which way you can get there. 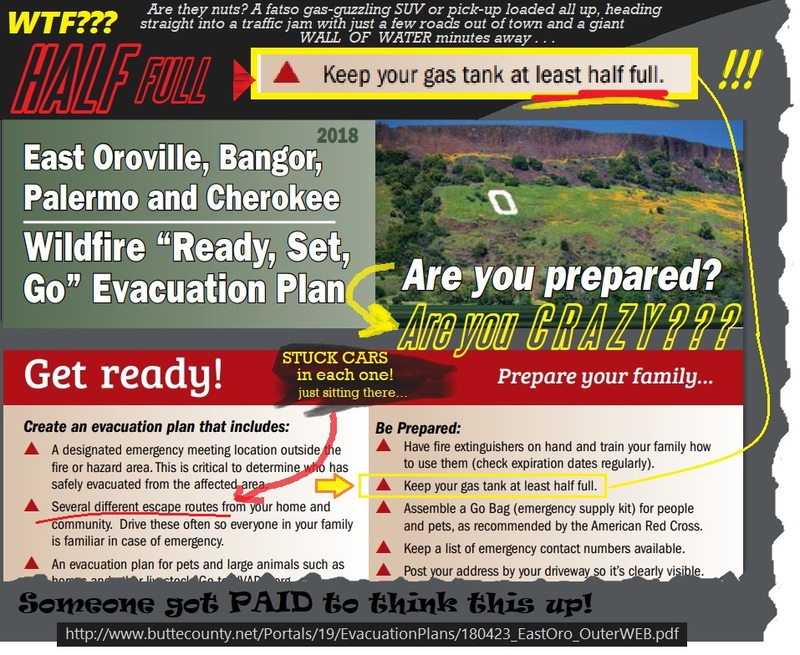 See the Evacuation-Zone-Finder-Map to see if they even offer a get-out-of-town route to take. You can sign up for a mobile phone ALERT here . 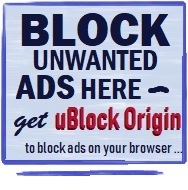 . . if you agree to surrender “data about your activities (e.g., the pages you viewed, the date and time of your visit, and location information from your IP address or GPS location)”. WE say FILL UP and take EXTRA GAS! The National Flood Insurance Program takes 30 days to kick in so buy some insurance and hope the dam holds out that long! We were just thinking of this topic with the fire in Paris this week. Something is very odd about the data cut offs* from the info page in the last 2 days and the way they shut all the water off to just a trickle. 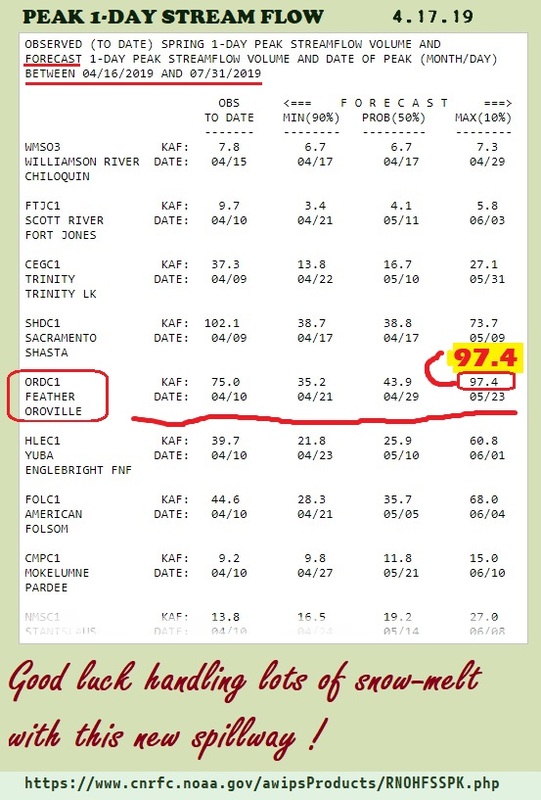 We know there’s heavy snow melt happening now and the dam water level is only rising, not lowering. 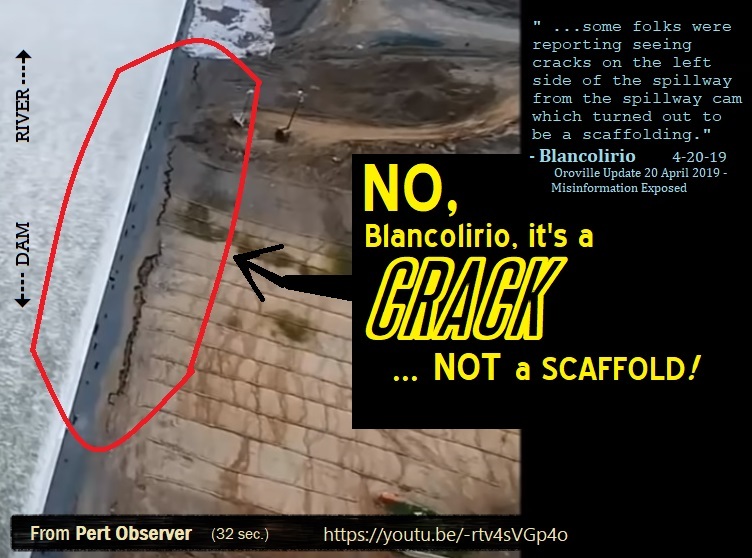 We suspect the “repairs” to the spillway have problems and there is a news black-out on it. Keep in mind the dam is the big employer in the town endangered by it.